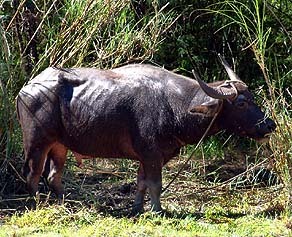 This one-horned carabao grazed by the roadside in Invariant. In the early part of the 20th century, Inarajan was a more isolated place than it is today. The road was not paved, and one relied on walking or occasionally riding a carabao cart for transportation. This gave Inarajan an even more relaxed and removed character that it has today. Before the car, the automobile came, there was a lot of walking being done Therese explains. And they were using carabao carts. My grandfather said that there were carabao cart trails in the mountain area where they would travelby carabao cart or by foot. I remember my grandmother saying they had horses but there wasnt an abundance of horses, mostly carabao. So, it would take a long time for them to travel in those days, when my grandfather was a little boy." My grandfather would say that when we had fiestas in Inarajan, people would start walking from Barrigada or Hagatña down to Inarajan. It would take them more than a day to come down to Inarajan. "By the time they came down, for a fiesta for example, or wedding or any major celebration that happens in the village, they would come down and spend a few days here. They would spend the night at a family or relatives house because it is such a long, long distance from Hagatña. "I remember, even my father used to walk for miles. He lived here in Inarajan but he would work in Hagatña. He would hitch a ride with somebody from here or start walking." A not uncommon sight in the southern villages. This one is in Umatac. 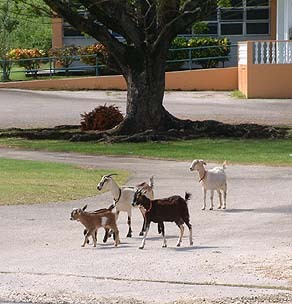 Goats wandering the quiet streets of Inarajan. Since it was really hard going from one place to another, everything was found here. They had bakeries, they were able to fish, grow their own food, raise pigs, raise chickens, farm. So they were able to sustain themselves around this area, they didnt have to depend on going downtown to buy meat or buy produce or anything like that. "I think the stores that were here supplied clothing, materials, and we had a lot of people who knew how to sew. I remember my grandmother had a foot-operated sewing machine. That was something for me to see that. After that my mom converted to a push-pedal sewing machine and that was something that changed a lot." "In my times," Tan Floren says, "there was a guy  he passed away, but the wifes still living  they had like a station wagon, so the people that wanted to do some shopping, theyd rent it. I think about ten of us could ride in that. Oh, we had fun! He took us for the whole day to go shopping. "We bought material, cloth to sew with, because we were sewing our own clothes. We had a store in here for the canned goods, but once you go there (Hagatña), you just do some shopping for that too, not only the material. Because we sew our own clothes, like the pants  my mom would sew that. But sewing shirts, and my kids uniforms, I made those. Even my sisters graduation dress, I sewed that, too." "The road is a lot different now. But you know, in spite of that in those days, our road was okay. The men on Sunday, they would play with that bachtu. They would make a round wood hoop, and then place a rod in the ground, and the men would compete for whoever could put that round wood on that post, that rod. So thats where they were having fun on Sunday. Some of them would be playing volleyball, in that grassy field there. They played baseball there, too. They had some activities in those days. The games, the volleyball, the basketball, they competed. "They had carabao racing, especially when there was fiesta. Young men, they competed on the carabao. Because its kind of hard to build that cart, you need a lot of materials. So they just rode on the carabao, and patted the back, and they would be jumping. Ha ha, they enjoyed that. 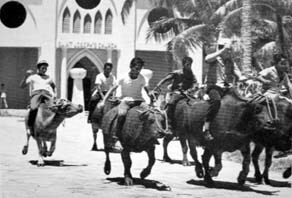 Carabao racing at the 1967 Coconut Festival. These reproduction latte stones are all that remains of Lanchon Antigo. There used to be Lanchon Antigo, ancient ranch, and, that was back in the '80s, Therese adds. 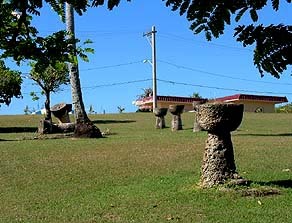 This living museum engaged Chamorro elders in demonstrating traditional crafts and activities, much as Gef Pago does today. 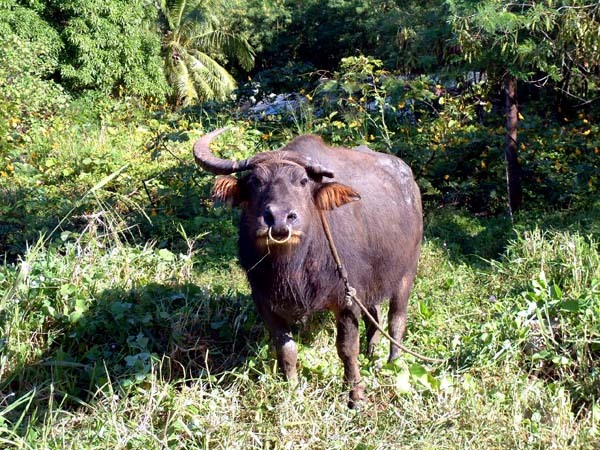 There were also carabao rides, cockfight demonstrations (without the dangerous blades attached) and other activities that were common in the early 20th century. The site of Lanchon Antigo was up by the Church, and the remnants of it can still be seen there. But a more powerful change foreshadowed the end of the carabao days. The abrupt arrival of Japanese Occupation brought the Second World War to Inarajan.